Transformational. Impactful. Defining. All of these words have been used to describe service virtualization – a technology so powerful that software engineering teams across the globe rely upon it to help protect their brand and their business. •Reducing the number of defects and increasing test coverage. 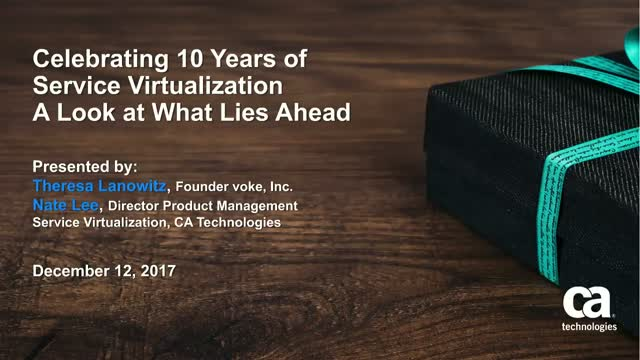 Join Theresa Lanowitz, founder of industry analyst firm voke and author of the leading research on service virtualization and its impact in the enterprise, and Nate Lee Director of Product Management for Service Virtualization at CA Technologies to learn about why service virtualization is an absolute must for any organization that wants to compete in the digital landscape and about what service virtualization can do for software engineering teams in the future.